My first State of the Vines post goes back to March 12, two months ago. I’d intended to update it sooner. I’ve been glancing at the vineyards as we drove by but haven’t had the chance to stop for a photo without trespassing, which I’m not inclined to do. We had the opportunity to visit the G’aia winery in Koutsi on Saturday, May 9. 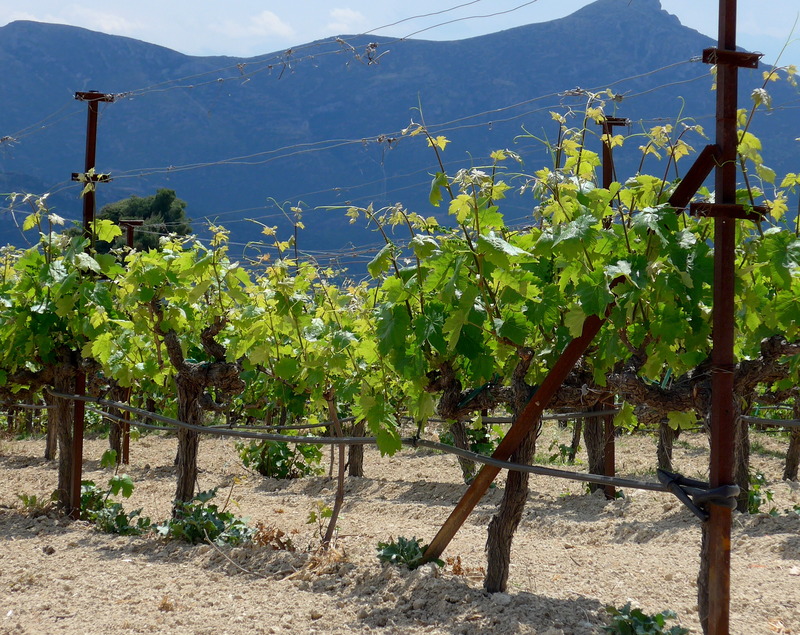 It was especially delightful because it is prominent in the tiny pantheon of our very favorite wineries, and because, as far as we know, it is only open to visitors twice a year – once in the Fall for the Great Days of Nemea festival, and once in the Spring for an event called Open Cellars that includes wineries across Greece. G’aia’s official tasting room is at its winery on Santorini, and is one of the island’s highlights. The first State of the Vines photo is from a vineyard on the flatlands, close to sea level. This vineyard is in the mountains, at an elevation of 1800 ft., so it’s probably a couple of weeks behind the lower vineyard. Nonetheless, the shoots are a couple of feet long, and the vines are covered in leaves, many of them full-size. The weather finally turned spring-like about a month ago and when that happened we noticed the shoots start, and then jump from day to day. I won’t be able to post additional State of the Vines updates this year but I hope to pick it up again next year with at least two more updates from later in the season. Tasting notes: The 2012 G’aia Estate has just been bottled, and it holds the promise of a legendary wine. It has the finest, most symmetric structure I’ve ever experienced. And it’s beautifully proportioned – big and satisfying without being overpowering. Achingly, it’s going to take a lot of patience to get the best from this wine. I’m going to try to resist opening a bottle for two years, and I expect it taste young even then. Opening way in advance is going to be the only way to handle this one. Good thing there’s a lot of other wine to keep us busy ’til then. This entry was posted in Greece, Peloponnesos. Bookmark the permalink.